Learn how a Software Defined Data Center can work for you. 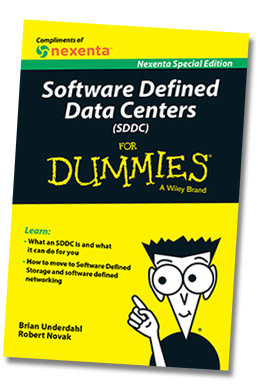 Software Defined Data Centers For Dummies, Nexenta Special Edition, shows you how recent advances in Software Defined Storage (SDS) and software defined networking (SDN) can work for you as you attempt to unify your systems into a consistent and well-formed architecture. In this book, you discover how to deploy solutions that support desktops, Big Data, web hosting, search engines, and massive amounts of storage as a cohesive system that serves your organization well. Fill-out the form below to receive your complimentary copy of the book. Click here to view software defined storage options.